The Shipped tab allows you to view and manage shipped orders within a given time range. Shipped orders are those that have been fulfilled and shipped by you or another SKULabs user. Skipped scans report: This report indicates which item scans have been skipped or overridden during fulfillment, along with the skipped quantity and users, in a given time period. Un-scanned items report: This report indicates which items were shipped without being scanned for verification first in a given time period. Scanned serial numbers report: This report indicates which serial numbers have been scanned, if any, in a given time period. 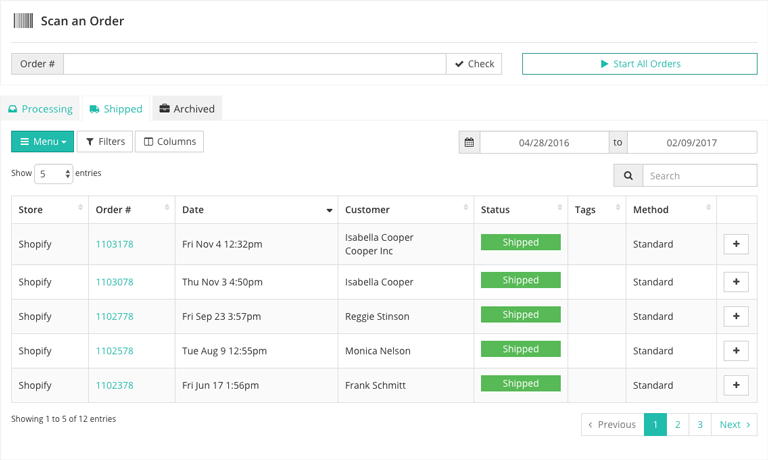 Filters: You can filter what is shown in the orders table by sales channel, fulfillment status, and more. Columns: You can show or hide any of the columns available for this table. Those column options are listed below. Search: This allows you to search for orders by their order number, customer name, and more. Your shipped orders are laid out in a table. You can expand an order to view more information about it, such as the shipment details, by toggling the Expand button. Store: The name of the sales channel through which the order was placed. Order #: The unique order number given to each order by their respective sales channel. Date: The date and time that the order was placed by the customer. Customer: The name of the customer that the order was shipped to. Status: The current fulfillment status of the order. This indicates if the order has been shipped in full or in part. Tags: Custom tags can be created and added to orders, items, or kits. Tags can be labeled however you choose, and can be used for various organization needs. To add tags to an order, toggle the checkbox on the order's row and toggle the desired tag in the Tags menu. Method: The shipping method selected by the customer when they placed the order. # Items: The total number of items (including multiple quantities of a single catalog item) that make up the order. Total: The total value of the items in the order. This may not reflect the amount paid by the customer due to other factors, such as sales tax and promotional discounts. Locations: The location or list of locations that an order's items are kept in. Destination: The state and country that the order is being shipped to. Packaging: The packaging dimensions that were used when processing the shipment(s). Weight: The package weights that were used when processing the shipment(s). Type: This indicates if the order has been combined, if it's a manual order, or if it's a simple order that was imported from a sales channel in the state it's in now. # shipments: The total number of shipments that have been completed for the order. Batch #: The batch number (if any) that this order was a part of during its fulfillment.